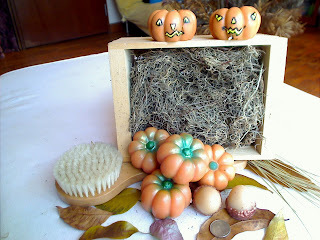 Halloween is coming and I wanted to put up these new pumpkin and acorn soaps. I love the smell of the pumpkin, soft vanilla, slightly nutty and a tiny hint of spice, simply yummy! I have scented the acorn with 'nutcracker' and they smell equally festive. The pumpkin is also nice to use in your guest toilet during Chinese New Year, minus the pumpkin face. I try to make soap for every room, every occassion and hopefully there is something for everyone in Soaping Paradise.